…..And Dorothy really tried to find work. She went looking for a job and just couldn't find one. She took a piece of old worn out sheet and wrapped it around her chest and pinned it real tight. I never will forget the big safety pin we used in it! Some way she had picked up some clothes. Dressed as a boy, she got this job and left with the band." Madeline added, "That's what I admired and loved about Dorothy, she was so innovative! She didn't cry or go around asking for help, she took responsibility for herself, and she was, just a kid. She chose it out of absolute necessity. What were the alternatives? A girl in her position might have ended up a prostitute. In an inscription on yet another photograph she submitted for inclusion in Reggie's [her mother’s] album. 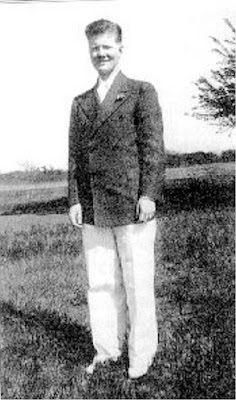 Date able to 1935, this is the earliest known photograph of Dorothy wearing a man's slicked-back hairstyle and a man's clothes: a tie; white shirt, pants, and shoes; dark double-breasted blazer with a boutonniere. On the back of the snapshot, in Billy's handwriting, is penciled the note "Your Child/Graduation." Perhaps labeling her cross-dressing as the equivalent of a high school commencement was intended as a joke that would give the family a way to accept it. It is amazing the similarity between this real life story and the movie comedy “Tootsie” with Dustin Hoffman playing a man that could find work, only as a woman.